In Clinical Assessment and Intervention for Autism Spectrum Disorders, premier scientist and LSU Professor and Distinguished Research Master, once again brings together a slate of experts to help clinicians sift through a complex and evolving area of psychological practice. The work clarifies and lays out the research and what is known about autism and related difficulties. While a straightforward compellation of research is valuable in itself, two main themes in Clinical Assessment create a more interesting and useful reference. First, the theme of evidence-based practice is echoed throughout, with authors often pointing to important gaps in the research and also that many treatments selected by consumers lack evidence for their value. Secondly, the theme of lifespan and the long-term view for assisting those with developmental challenges is addressed in many of the key chapters, helping the clinician or research look beyond early childhood. Louisiana contributions include Dr. Matson and Dr. Marie S. Nebel-Schwalm, Dr. Karen Sheridan, and Dr. Troy Raffield writing from Pinecrest Developmental Center in Pineville, Louisiana. The text is a bold effort to inform the clinician and research psychologist in a field where there are many gaps in what is known and many approaches that are not evidenced-based. The text is a collection of experts discussing what is known in the field, often in stand alone chapters, and echoing the message that there is a large amount we still do not know. Readers will find guidance for best practices in working with children who struggle with developmental delays, and also for better awareness to a life-span perspective. Clinical Assessment is structured in three parts, Part I – Introduction, Part II – Assessment, and Part III – Interventions. In Part I, Chapter 1, “Assessment and Intervention in Autism: An Historical Perspective,” authors summarize the history and development of the diagnostic criteria, as well as the history of treatment. Chapter 2, “Evidence-Based Practice for Autism Spectrum Disorders,” provides the current state of evidenced-based treatment, with a description of “science, pseudoscience, and antiscience.” Criteria for evaluating different treatments is reviewed and several strategies in applied behavior analysis (ABA) are highlighted. The author critiques non-behavioral treatments. In Chapter 3, “Autism Spectrum Disorders: A Lifespan Perspective,” authors review the importance of the lifespan perspective, a theme mirrored in many of the chapters that follow. The author introduces sections on “Lifespan Theories” and “Outcomes Across the Lifespan.” They provide a review of outcome evidence and discuss common concerns that clinicians will encounter in key developmental periods. The authors point out that ASD are five disorders that share features but that researchers and clinicians do not always agree on the methods used to diagnose or even the distinctions between disorders on the spectrum. This is a critical area since families need information to “maximize the child’s quality of life,” the authors note. Sections on “Etiology,” “Genetic,” “Neurobiological,” “Immunological,” “Perinatal,” and “MMR Vaccinations,” are included. They summarize that there is little evidence of causal variables (80 percent of those with ASD have no known cause) and that among the theories such as immunological, “consistent empirical results are lacking.” Assessment challenges are reviewed in “Differential Diagnoses within the Spectrum,” “Comorbid Psychopathology and Differential Diagnoses,” “Intellectual Disabilities,” “Language Disorders.” Included are descriptions of interview methods, observational systems, clinician rating scales, and over 10 informant rating scales and checklists. Chapter 5, “Assessment of Challenging Behaviors in People with Autism Spectrum Disorders,” focuses on functions of assessment when clinicians are looking at problem behaviors such as aggression, tantrums, stereotypy, and eating behaviors. In “Communication and Social Skills Assessment,” Chapter 6, authors note a consensus that a comprehensive assessment in this area is of vital importance to providing help to families and individuals. They review theory, classification, and the purposes of assessment. In “Assessment Procedures,” authors lay out specific information for the reader in behavioral observation, role-play tests, rating scales, and behavior checklists. Chapter 7 is an overview of “Assessment of Independent Living/Adaptive Skills.” Sections include, “Home-Based or Parent/Caregiver-Report Assessments,” “School-Based or Teacher-Report Assessments,” “Clinic-Based or Clinician-Report Assessments,” and “Self-Report Assessments.” Authors note that this is a critical area related to “level of independence for community integration” and write that in some cases, adaptive behavior is more important than IQ, especially in adolescence and adulthood. Chapter 8 is “Pharmacology Effects and Side Effects.” Authors look at instruments for assessing response to psychotropic medication, noting important gaps in research and evidence. Part III, “Interventions,” begins with Chapter 9, “Challenging Behaviors.” Authors cover the definition of challenging behaviors and those common to ASD. In “Approaches to Intervention,” authors review the evidence for behavioral treatment, and conclude that the ABA approach for reducing these behaviors should become the norm. “Teaching Adaptive Skills to People with Autism,” Chapter 11, is authored by two Louisiana psychologists, Dr. Karen Sheridan, now at the Resource Center on Psychiatric and Behavioral Supports in Hammond, previously with the Pinecrest Developmental Center, in Pineville, Louisiana, and Dr. Troy Raffield, who continues with Pinecrest. The authors point out that developing skills in adaptive functioning is critical when transitions to community living are the goal. These skills, the authors note, are associated with quality of life and so have absolute value. They review “Applied Behavior Analysis,” “Task Analysis,” “Visually Cued Instruction,” and “Modeling.” They review techniques including sections on vocational skills, domestic skills, self-care, community, and leisure skills. The final chapters, “Comprehensive Treatment Packages for ASD: Perceived vs. Proven Effectiveness,” a review of “Pharmacotherapy,” completes the work. 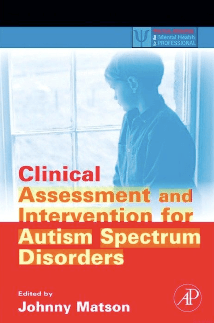 Clinical Assessment and Intervention for Autism Spectrum Disorders offers an important foundation for those wanting to ground themselves in evidenced- based information in this essential area of clinical practice and research. Editor’s note: An expert in mental retardation, autism, and severe emotional disorders in children and adolescents, Dr. Johnny Matson has produced 600+ publications including 37 books. Among many duties, he is Editor-in-Chief for Research in Autism Spectrum Disorders (Oxford England) and Editor-in-Chief for Research in Developmental Disabilities (Oxford, England).